Background: Asthma is one of the most significant diseases worldwide and causes overwhelming costs physically and economically. The study of asthma has revealed various groups of asthma patients who share phenotypic characteristics that naturally elicit the need for personalized asthma therapy. An increasing amount of pharmacogenetics research, genotype-based trials and precision medicine trials have been conducted to investigate this problem. Methods: A systematic bibliography retrieval was performed in MEDLINE (Ovid) and PubMed for our topic and all relative records were exported and screened. Results: We identified 377 publications and added 4 articles related to this topic artificially to reach a bigger scope, of which 36 met the inclusion criteria. 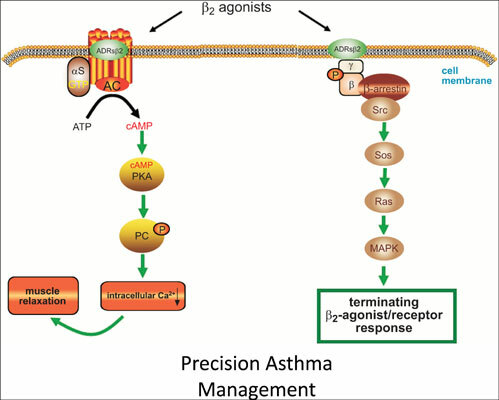 Our review focuses on the three most widely used treatments for asthma management, which are β-adrenergic receptor agonists, inhaled corticosteroids (ICS) and anti-leukotriene modifiers. We summarize the existing loci reported in the literature that are potentially associated with drug responses to typically used medications. Conclusion: Our results suggest that a genetic test with high predictive accuracy could predict therapeutic responses, and proper management can be achieved in asthma patients. This personalized approach to curative medicine should make way for the realization of personalized preventive and predictive medicine in the coming years. Keywords: Asthma, pharmacogenetics, β-adrenergic receptor agonists, inhaled corticosteroid, anti-leukotriene modifiers, candidate gene approach, GWAS. Title:How to Control Asthma with Personalized Management: Where Do We Stand Now? Keywords:Asthma, pharmacogenetics, β-adrenergic receptor agonists, inhaled corticosteroid, anti-leukotriene modifiers, candidate gene approach, GWAS. Abstract:Background: Asthma is one of the most significant diseases worldwide and causes overwhelming costs physically and economically. The study of asthma has revealed various groups of asthma patients who share phenotypic characteristics that naturally elicit the need for personalized asthma therapy. An increasing amount of pharmacogenetics research, genotype-based trials and precision medicine trials have been conducted to investigate this problem.